Sirin Labs recently published several announcements regarding the team’s progress on FINNEY, the secure blockchain-enabled smartphone that could bring cryptocurrency payments to the masses. Through a series of videos and blog posts, the Sirin team fielded questions from fans and finally revealed FINNEY’s finalized hardware specs. Separate interviews with Guy Shirazi (VP of Product) and Amit Krelman (VP of R&D) also shed some light on FINNEY’s most promising features, including its built-in cold storage cryptocurrency wallet. Sirin Labs announced a strategic partnership with Cardano early in 2018. While no major news about this partnership has been released since then, the team did recently meet with IOHK founder and CEO Charles Hoskinson to demonstrate FINNEY’s hardware and to discuss the future of the collaboration. Amit Krelman, VP of Research and Development for Sirin, reiterated that working with Cardano is “for sure.” ADA storage and payments via FINNEY and Sirin OS dapps are currently works-in-progress. The partnership will likely extend beyond wallet support in the future, though no further details are currently known. When FINNEY releases in late 2018, a large factor in its success will be consumer availability. Sirin Labs has already announced a deal with Taiwanese electronics manufacturer Foxconn Technology Group to develop FINNEY’s hardware. Now, discussions are underway with cell phone service providers to provide an active market for the device. Members of Sirin Labs recently traveled to China, Korea, and Japan to meet with several unnamed wireless carriers. The goal was to demonstrate FINNEY’s unique capabilities and to kick off talks for future partnerships. No details have been released at this time, though the team seemed confident the meetings went well. The highlight of Sirin’s recent announcements are the tech specs for FINNEY. Users anticipating flagship-quality specifications to match the device’s $999 price tag were not left disappointed. FINNEY will come with a 6-inch 18:9 display with 402 PPI pixel density, powered by a Snapdragon 845 chipset with 128GB of storage and 6GB RAM. The device runs Android 8.1 Oreo with a Sirin OS layer for the custom blockchain and dapps features. A 3280 mAh battery is set to provide “all-day” power for FINNEY. If that’s not enough, a built-in quick charge feature lets users go from 0 to 50% in just 30 minutes. Fully charging the device will take up to 2 hours. A secure P2P resource sharing feature, which is currently in development, will allow owners to share battery power with other FINNEY users (and earn SRN tokens for doing so). Other hardware features include a USB-C connector and an external SD card slot, but no headphone jack. A far as software is concerned, the team announced that monthly updates to Sirin OS can be expected once FINNEY is on the market. FINNEY includes a built-in cold storage wallet for cryptocurrencies. The feature requires internal moving parts to operate, which makes the phone potentially more vulnerable to the elements than other smartphone devices. Sirin compensates for this by making FINNEY both water- and sand-resistant. As VP of Product Guy Shirazi states, this will be enough to protect against rain or spilled wine, but you probably don’t want to dip FINNEY in the ocean for half an hour. Shirazi notes that the team put a lot of thought into the security of FINNEY’s cold storage wallet. There are “multiple levels of security” in place to prevent unauthorized access, making it more secure than a standard cold storage solution like Trezor or Ledger Nano S.
FINNEY’s wallet will also be impossible to physically remove from the device. If the phone itself is stolen and the thief attempts to separate the wallet, it will be destroyed in the process. One of the obstacles to mass adoption of cryptocurrencies is the difficulty of handling payments. Novice users aren’t willing to navigate exchange interfaces and juggle wallet addresses just to make a quick purchase. Even if they do, having to swap tokens to pay in specific altcoins can be time consuming and frustrating. 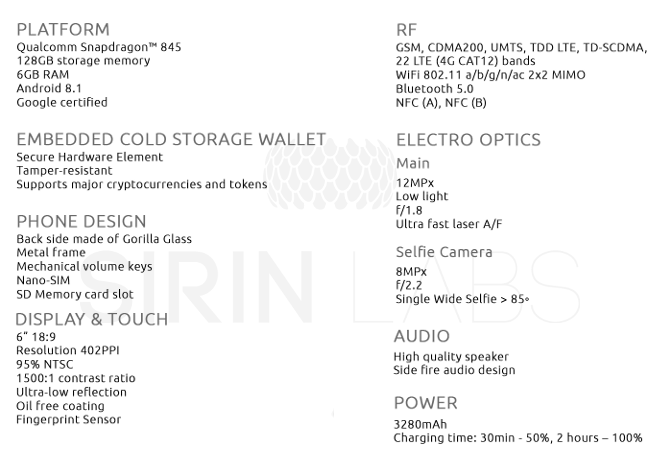 Sirin Labs is working on a Token Conversion Service (TCS) that’s built into Sirin OS and the FINNEY smartphone. It allows users to make purchases in one cryptocurrency but pay in another, all without having to manually swap via an exchange. In the team’s recent example, a FINNEY user could walk into a shop or restaurant that accepts Bitcoin, scan a QR code, and instantly pay using Ethereum or ADA. TCS handles the transaction details behind the scenes by utilizing Sirin’s SRN token as an intermediary. A lot is going on at Sirin Labs, so much that the team has already promised new announcements in the coming weeks. FINNEY’s final design will be showcased by the end of May. This will include details about hardware button placement as well as access to the cold storage wallet. A few weeks after this, Sirin will release a teaser of their upcoming FINNEY commercial featuring soccer star Lionel Messi. 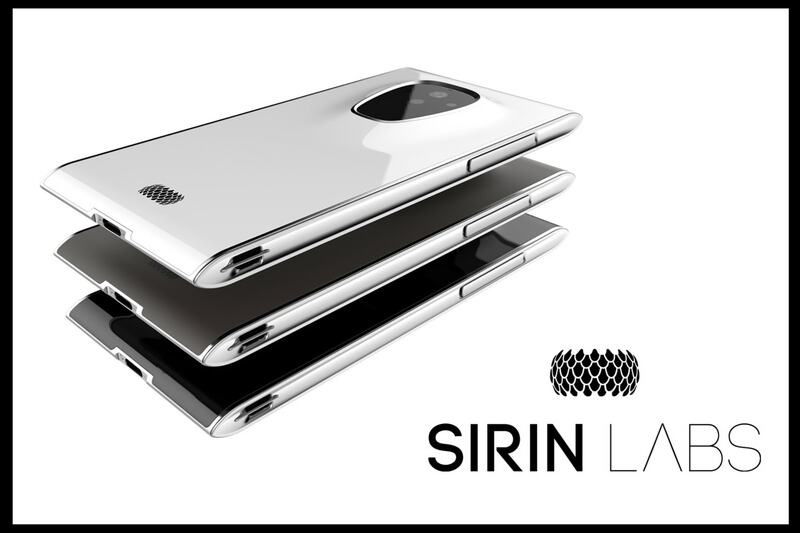 For more information about Sirin Labs and the FINNEY blockchain smartphone, follow the team on Facebook or Medium.